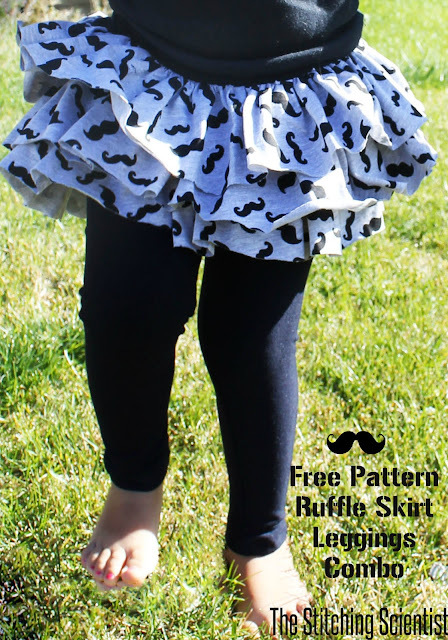 I love ruffles on little girls. They are bouncy, twirly and never goes out of style. 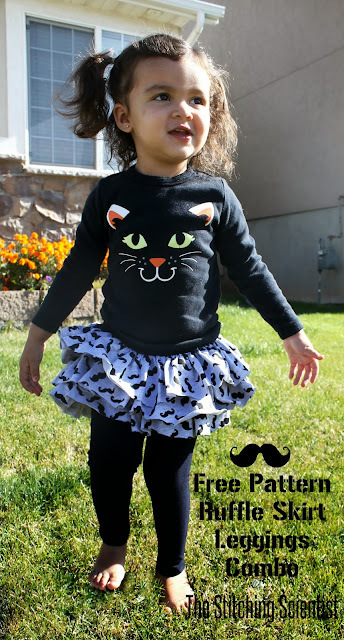 With summer ending and colder days approaching us here in the Midwest, I decided to make Mila a ruffle skirt with leggings, so she can still enjoy twirling in the cold. 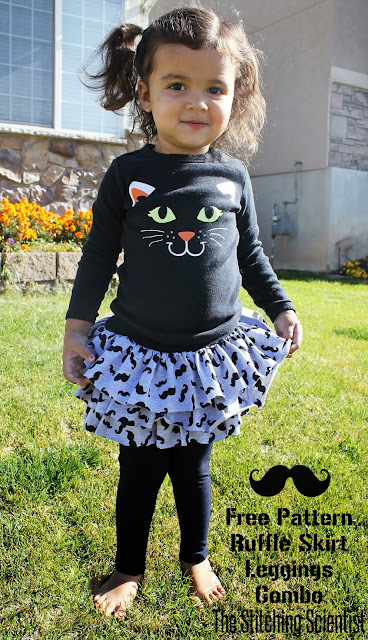 I was going through my scraps last night and found this fun black mustache on gray cotton jersey fabric I purchased from Girl Charlee Fabric Shop. Since I only had 1/4 yard, I thought a toddler size ruffle skirt would put it to good use. I also found some black cotton spandex knit I also purchased from Girl Charlee that matched perfectly with the mustache print. The project took a bit longer than most since it calls for ruffles but I think it was worth it. Mila loves it and it was fun to watch her twirl in it. The entire bottom costs about $5 to make which is a steal as I found similar designs close to $30 online. I think it turned out pretty good. What do you think? It was a bit cold outside so I had to do some candy bribery to get her to go outside on the grass. Once she was there, she was all smiles. Lets get to the tutorial on how to create this gorgeous bottom for your little girl. 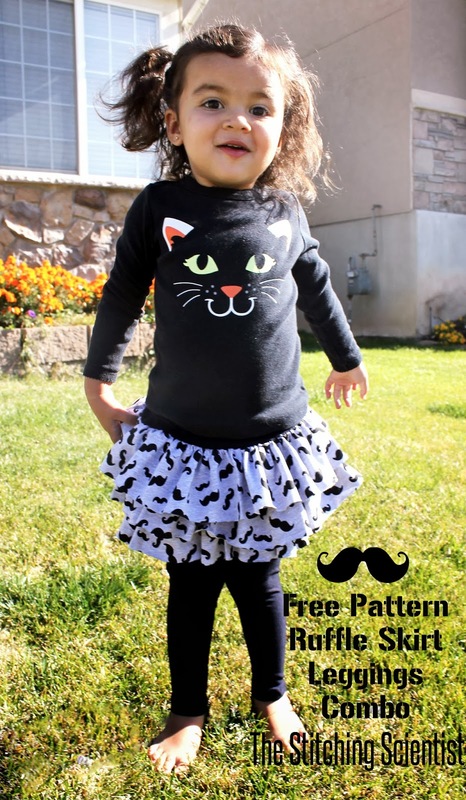 You can download a 2T leggings pattern HERE or draft your own in any size from the first few steps in the tutorial. Although I used knit for the ruffle skirt, it can be made with regular woven cotton. As long as your leggings are knit, the two pieces will go together nicely. Lets start with the leggings first. Fold your fabric. Lay a pair of leggings that fits your child on the fold of your fabric and cut all the way around, leaving about 1/2″ for seam allowance. Repeat for both legs. Now that you have both legs, you need to sew the center crotch together with right sides facing each other. To do this, you will sew the back crotch together and then the front. Once you have both of your crotch pieces sewn together, sew the legs right sides together intersecting at the bottom of the crotch. Cut out 3 steps measuring 4″ wide X 2.5 times the waist of your child. 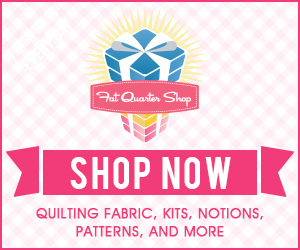 So for my 2T who has a waist of 20″, my strips measured 4″X 50″. Measure the waist from your legging and cut out 3 strips ~2″ x waist measurement taken from the legging. My strips ended up being 2.5″x 18″. Gather your long strips to match the short strips. To gather, set your stitch length to the longest setting, lock in your first stitch and sew all the way down your strip about 1″ from the top. Once you have it all sewn, pull the bobbin thread to gather. Sew the gathered strip to the short strip right sides together. Repeat steps 3-4 for your remaining 2 ruffles. 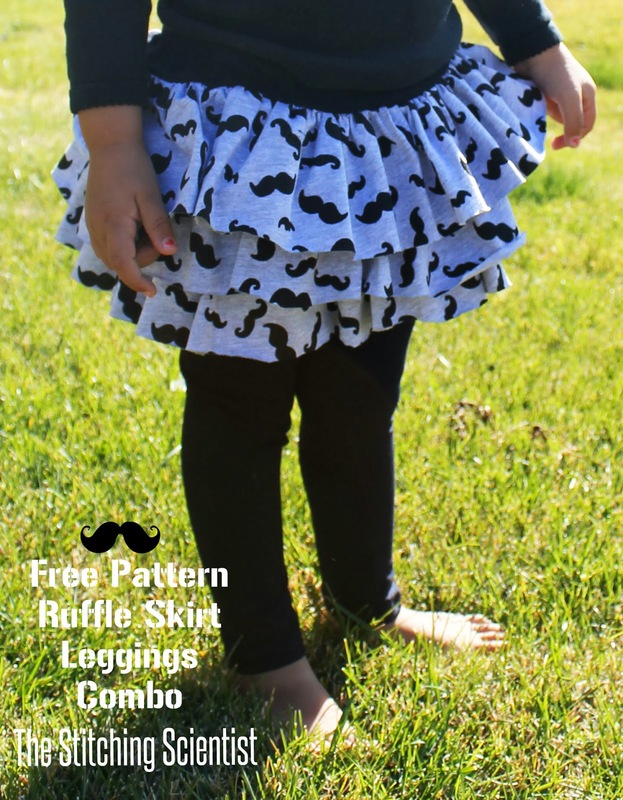 Sew the sides of the ruffle skirt together, right sides facing each other. 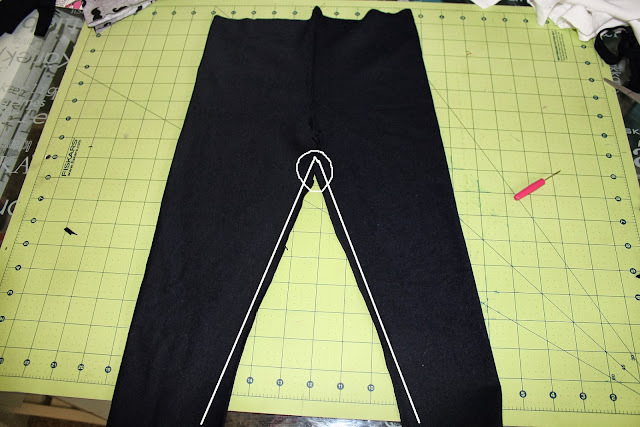 Place the legging inside of the skirt so that the top pieces line up. Pin all the way around lining up the back of the skirt to the back of the leggings. Sew all the way around the top. Fold down 1″ from the top and sew all the way around leaving 2″ opening to thread your 3/4″ elastic. Once the elastic is in, sew the opening close. (You can serge the top before you do the elastic but knit doesn’t ravel so its not necessary.) That’s it its done!